Welcome to PA Auto Sales! FREE 3 MONTH POWER TRAIN WARRANTY CONTRACT & 3 YEAR ROAD SIDE ASSISTANCE ARE INCLUDED on every vehicle; extended long term warranty contracts are available. 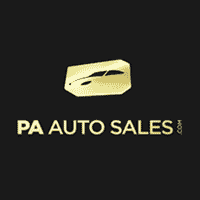 Welcome to PA Auto Sales.com, your home for quality used vehicles in the Philadelphia area. Whether you are searching for a family sedan, a pickup truck for your business, or a sporty coupe to impress your friends, PA Auto Sales is here to help. Our showroom is packed full of excellent used autos and we offer some unbelievable pre-owned specials. So, if you are searching for a great deal on a used car for sale in Philly, there really is nowhere better than right here. At PA Auto Sales, we strive to make your pre-owned vehicle shopping experience as easy and hassle-free as possible. We understand that finding the best financing plan can often be one of the trickiest parts of the used auto shopping experience. That’s why our dedicated auto financing team will work hard to make sure you get a low monthly payment that works for your budget. By working with an abundance of auto lenders from across the country, our auto financing team gets everybody the best rates possible. We finance everybody – even if your credit score isn’t quite what you would like it to be. The PA Auto Sales showroom is chock full of quality used cars for sale. We offer sedans, SUVs, pickup trucks, hybrids, coupes, and so much more. Of course, all of our vehicles are fully serviced by our team of highly skilled technicians before they ever hit the dealership floor, so you can rest assured that your vehicle will run smoothly. In fact, PA Auto Sales is so confident in the quality of our pre-owned autos that we offer a free CARFAX report on every car in the store. This helpful report allows you to learn everything there is to know about the vehicle before you make your purchase. You will be able to see a detailed breakdown of every car’s history – so you will know exactly what you are buying. Honesty and transparency are king at PA Auto Sales. We believe that a great used car buying experience shouldn’t stop when you leave our store. As such, we are proud to include three years of roadside assistance and a one-year PA state inspection with every vehicle. That is two fewer things for you to worry about over the next few years. There’s a reason they call us the best auto dealer in Philly – and it’s not just because of our fantastic pre-owned specials! We are with you every step of the way. At PA Auto Sales we always want to keep our customers on the road. 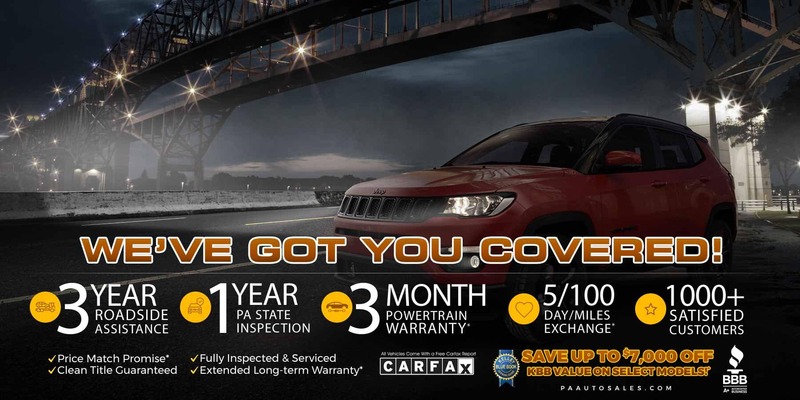 Because of this, every used car for sale at PA Auto Sales comes with a free 3-month Powertrain Warranty* as standard. Of course, if you would like to explore the added protection of an extended, long-term warranty*, our team will be more than happy to assist you. We are proud to stand behind the quality of our fantastic used cars. You shouldn’t be expected to drive a car that you don’t like. So, in the unlikely event that you are not 100 percent happy with your new vehicle for any reason, PA Auto Sales has you covered. We offer a 5-day/100 mile Exchange Policy* on every vehicle for sale in our store. We understand that your circumstances and preferences can change, so we strive to make things as easy as possible for you when they do. Simply return your car to the PA Auto Sales lot and we will do our best to find you a vehicle that works a little better for your needs and tastes. Now that you know a little bit more about what sets PA Auto Sales apart from the competition, we welcome you to take some time to browse through our website. Designed with the customer in mind, our website allows you to search through our large inventory, schedule a test drive at a time that suits you, contact our helpful financing team, and so much more. We think you’ll be pretty pleased with what you discover! When you are finished taking a look online, come on down to our showroom at 11600 Roosevelt Blvd, Philadelphia, PA 19116. Our team will be standing by with a warm handshake and plenty of light refreshments! Of course, if you have any specific needs that you would like us to help you with, you can always call ahead to schedule an appointment. We are available during regular business hours at 215-330-0539. PA Auto Sales has been in business since 2008, and is proud to call the city of Philadelphia home. The next time you are searching for a used car in Philly, Bustleton, Somerton, Bensalem, Upper Darby or Feasterville-Trevose, we would be honored if you got in touch with us. From our amazing pre-owned specials to our wonderful customer service, you’ll be glad you went to PA Auto Sales – the best auto dealer in Philly! Great experience purchasing a car with Joe's help. No pressure to buy, just a courteous and friendly environment. Worked with Ray and he was fantastic. Got me into a beautiful Mercedes Benz CLA 250. Great team and really work to get the job done. Ray is a very Good ! !